No need to visit the Big Easy to celebrate Mardi Gras. 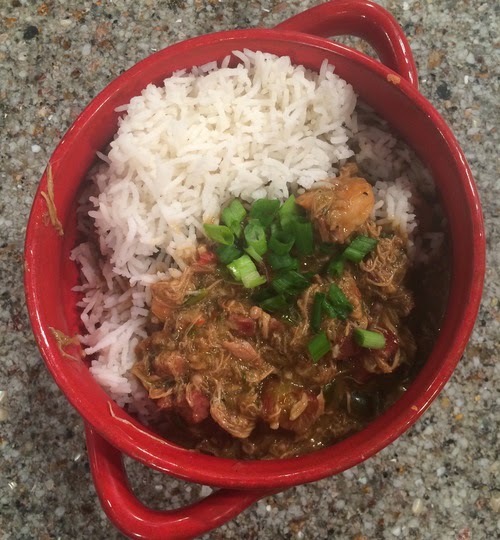 Ocean Catering’s Chef Shane is bringing a taste of Nola to you in honor of Fat Tuesday. I know I am a little late with publishing this guest post recipe but still wanted to get it onto the blog for all of you to enjoy. It looks delicious!!! Heat the oil in a heavy bottomed Dutch oven over medium-high heat. Sprinkle the flour over the oil, add 2 tablespoons of margarine and cook over medium heat, stirring constantly, until brown, about 10 minutes. This is roux. Let the roux cool. Return the Dutch oven to low heat and melt the remaining 3 tablespoons margarine. Add the onion, garlic, green pepper and celery and cook for 10 minutes. Add Worcestershire sauce, Cajun seasoning, Gumbo File, salt and pepper, to taste and a 1/4 bunch parsley. Cook, while stirring frequently, for 10 minutes. Add 4 cups beef stock, stirring constantly. Add the chicken and sausage. Bring to a boil, then reduce the heat, cover, and simmer for 45 minutes. Add tomatoes and okra. Cover and simmer for 1 hour. Just before serving add the green onions, shrimp, crawfish and crab meat. Simmer 10 more minutes and then add chopped parsley. Serve over white rice.